Fiction – paperback; Picador; 400 pages; 2015. 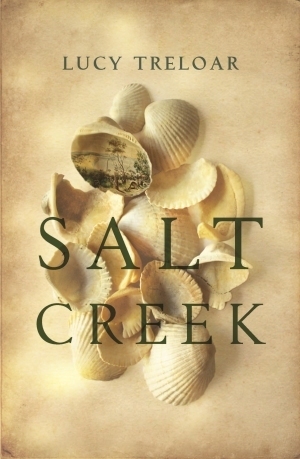 Lucy Treloar’s Salt Creek is a superb historical novel that tells the story of one family’s attempt to settle — and tame — a remote region on the South Australian coast in the mid-19th century, and the dreadful, heartbreaking repercussions that follow. It is told through the eyes of the eldest daughter, Hester Finch, now a grown woman living in Chichester, England, looking back on her youth. Hester’s voice — well-bred, kindly, intelligent and full of regret — is the standout feature of this rather astonishing debut. From the very start she draws you in to her intimate account; it really does feel as if she is in the room with you as she confides her inner-most secrets and anguished past. And the tale she tells, of a fine upstanding political family who fall on hard times and how they never seem to win back the fortune they lost, is a compelling one. A key element of the story is the Finch family’s relationship with the Ngarrindjeri people, the traditional owners of the land upon which they now have a pastoral lease. The Ngarrindjeri have lived here for thousands of years in harmony with the natural world, but Stanton Finch, patriarch of the family, thinks it is his duty to civilise them even though he firmly believes “all men are created equal”. Indeed, he turns his belief into action, of a sort, by taking in a young aboriginal boy, Tull, who becomes one of the family (he’s especially close to Fred, Stanton’s second youngest son, with whom he’s closest in age), though he’s free to come and go as he pleases. But while Stanton’s attitude towards the Ngarrindjeri is initially respectful and kindly — he is happy to share the land and the water holes with the very people he’s dispossessed and shuns any notion of scaring them off with guns (the prevalent attitude of white settlers at the time) — tensions inevitably arise when Stanton’s herd of dairy cows (and later sheep) trample the grasses and rushes, and muddy the water holes upon which the indigenous people rely. Later, when two of Stanton’s sons are accused of stealing fish from a “pen” in the lagoon he lies to cover for them, an act that belittles him in the eyes of both Tull and Hester, who know the truth. It is but the start of a slippery slope, for the unconscious racism of the man (and of this two arrogant older sons) will ultimately lead to the family’s undoing. Another, perhaps less obvious, element of the story is the role of women in society at the time. Hester and her headstrong young sister, Addie, are fortunate to be brought up by parents who believe women should be educated. But that does not save Hester from the drudgery of running the household when her mother, grieving over the loss of a baby and a drastic fall in her social standing, is incapable of doing much beyond getting out of bed each morning. Between cooking and cleaning, milking cows and making cheese, it also falls to Hester to educate her younger siblings, leaving little time for much else. It is to Hester’s credit that she does not take the easy escape route by marrying the first man who takes her interest. Although she does eventually flee the family home, it’s on her terms, not her father’s. Everything stilled and sound and sight and the warmth of early sun resting on me were faint. There was just the low drone of insects and the higher calls of birds; even the waves, so loud the day before, were muted. All that space around me. But among the quiet beauty of that coastal landscape there lies a kind of Gothic dread. Initially it is a fear of the blacks (and what they might do with their spears); later it’s alarm over a neighbour’s nefarious behaviour; always it is the sense of entrapment that results from being so far away from “civilisation” (Adelaide is the nearest city) which causes fright, especially when medical emergencies arise — or young women want to flee the family home. Needless to say, I fell a little bit in love with this novel, not only for the beautiful depictions of the landscape, but for the quiet courage of Hester and the way her story gently unfolds over seven eventful years. It’s a historical novel, but Treloar is careful not to reinterpret 19th century attitudes through a sympathetic 21st century lens: she allows her readers to come to their own conclusions about the dispossession of the Ngarrindjeri people through the actions and conversations of the white characters in this novel. Salt Creek won the 2016 Indie Book of the Year for Debut Fiction earlier this year. It has also been shortlisted for the 2016 Miles Franklin Literary Award, the winner of which will be announced later this week. Unfortunately, it is only available in Australia. I’m hoping some savvy publisher picks it up for publication in the UK and North America, because this is the kind of book that would appeal to a wide audience and, indeed, deserves one. An audio book version is available, if you are that way inclined, otherwise you could take the plunge and buy the print version direct from Australia. I recommend Readings (in Melbourne) for superb service. This is my 33rd book for #ReadingAustralia2016 and my 23rd for #AWW2016. This sounds right up my alley, Kim, particularly the descriptive language and charactericisation. Do you know of a bookseller who imports Australian books? Sadly not, which is why I buy so many books when I go to Australia every couple of years. Let’s hope your review is picked up by a UK/US publisher, then. Bit of a pricey book for me otherwise! It sounds as if it would tie in nicely with Tim Winton’s titles – perfect for Picador. Perhaps you should mention it to them. I would love to read this book, but so far it is only available here as an audiobook. For some reasons, I can’t listen to audiobooks. I will keep watching for it. I’m not an audio book fan either… Very sad it’s not available outside of Australia. I’ll keep watching for it. I’ve been waiting for your review of this to see if it lined up with my thoughts, that it sounds like a must read and it certainly does! I do hope it finds a publisher, maybe the new Aardvark Bureau imprint of Gallic Books, I’m going to tweet them, they’ve started to publish occasional NZ and Australian fiction. There’s a ready made audience for it in the UK surely. Brilliant review! I’m so cross with myself that I didn’t get this when I was in Brisbane last Easter. I did, however, come home with The Natural Way of Things which I’m going to recommend to my book club next month. Also came back with Jen Craig’s Panthers and the Museum of Fire and Gail Jones’ Five Bells but haven’t read them yet. All due to your reviews by the way! So great to see this being published in the UK in September and an interesting article in the Guardian about the author’s reservations in depicting an indigenous character. I loved it, but was exhausted by it, particularly seeing it through the eyes of Hester, the elder sister. Such a great job of making the reader feel something of the characters experience and an excellent depiction of the struggle ad sacrifice of women.